Have limited time to get your crown, veneers, inlays or onlays done? Are fearful of the dentist and avoid getting work done on your teeth? Still want quality designed, color-matched and highly durable restorations in one appointment? If you answered yes to these questions then CEREC Beverly Hills could be just what you're looking for. Dental Group of Beverly Hills, Beverly Hills, CA. is pleased to offer our patients CEREC restoration services - a superior method of creating precisely-designed, color-matched and highly durable ceramic restorations right in our Beverly Hills dental practice. CEREC 3D allows your cosmetic dental work to be completed in just one appointment. From simple fillings, inlays to partial crowns, full crowns to veneers, CEREC delivers results that patients will be happy with, all in a single visit. With Beverly Hills CEREC, there's no need to wait while your restoration is made in our Beverly Hills dental lab. What used to take several weeks now takes just one dental visit. Dental restorations made by CEREC often require less drilling and fewer dental anesthesia injections. No messy impressions are needed to create your restorations. An excellent choice for fearful patients who can't handle multiple dental visits. The patient does not sacrafice quality for a quick fix -- your finished product will be just as durable as a restoration made in a outside dental lab (should last 15-20 years). Dimishes possibility of bacterial contamination so sensitivity is extremely rare. 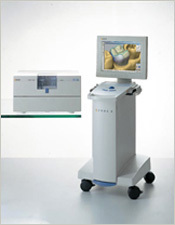 The beauty of a CEREC restoration is just that -- its beauty. Unlike unsightly silver dental fillings, CEREC fillings or restorations are made of tooth-colored ceramic (porcelain) so they look natural and actually feel like your own teeth! Restoration Creation -- Your dentist uses the CEREC machine to design and create your tooth filling, dental crown or veneers, right in our Beverly Hills dental office!